Is the work of an investor or an analyst working diligently through a company’s analysis any different than that of a detective in search of the ultimate truth in a crime? I believe not. 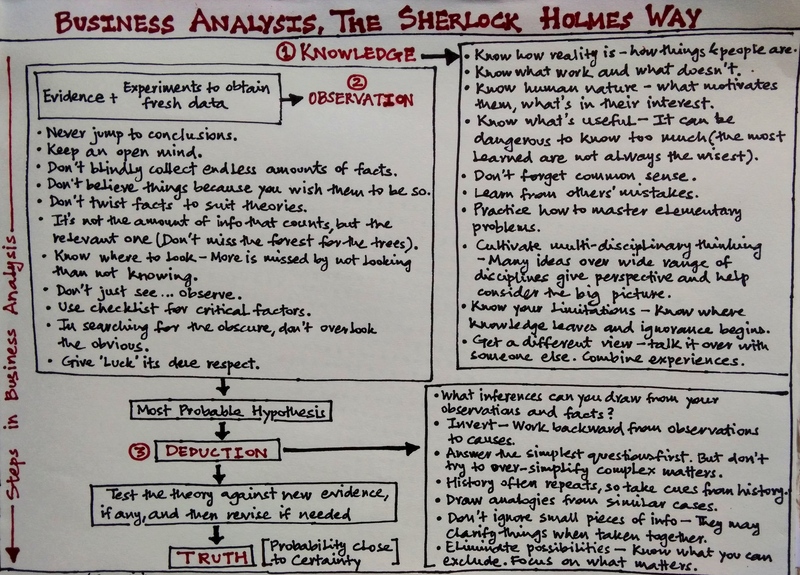 And thus, Bevelin’s work on Sherlock Holmes is a great guide for anyone wanting to learn how to analyze businesses to pick the right kind of stocks for long-term investment. …a hand-made poster that now adorns my wall and which suggests a series of checklist points that can be of immense help while analyzing businesses. Human nature is a strange mixture, Watson. You see that even a villain and murderer can inspire such affection that his brother turns to suicide when he learns that his neck is forfeited. Education never ends, Watson. It is a series of lessons with the greatest for the last. The essential factor in this method consists in working back from observations of conditions to the causes which brought them about. It is often a question of deciding the doings of yesterday by the records found today. Breadth of view…is one of the essentials of our profession. The interplay of ideas and the oblique uses of knowledge are often of extraordinary interest. The advances on the laboratory side and the perfection of instruments have added much to our powers of diagnosis, but they have given some men the idea that they are everything and the use of one’s eyes and hands is looked on as old-fashioned. The man whose first idea in an obscure thoracic case is to have an x-ray plate taken and who cannot “bother” with physical signs does not deserve the name diagnostician. It’s brilliant, this slim 73-page book that culls the essence of the world’s greatest detective’s teachings. Peter Bevelin demonstrates what students of Holmes have always known – that the adventures of the fictional detective are not just entertaining tales, but a road map on how to think, do research and hit upon a solution to a problem, whether it pertains to crime, or life, or investing. “You know my methods. Apply them!” Holmes said in The Hound of the Baskervilles, which was published in 1902. More than a century later, that advice remains of great importance if you want to become a better thinker and investor. Superb post Vishal. It’s beautiful to discover the method to the legend’s madness. The scene in Game of Shadows is where Dr. Watson is ushered into a room filled with pinned notes, all of which connect to Dr. Moriarty, is my favorite part. The lessons from Bevelin and Munger can be connected to Daniel Kahneman’s explanation of System 2 – the system we can use to override assumptions and emotions, and instead use to make rational decisions. Thank you for sharing the wisdom. Respect. Love this article. Big fan of the books. Lovely penmanship in that graphic – that’s a winner!